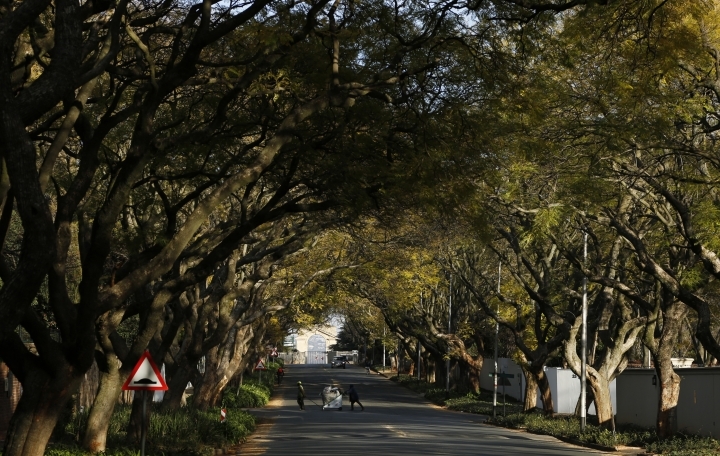 JOHANNESBURG — One of the world's largest urban forests is under threat from a tiny beetle. Trudy Paap, a forest pathologist at the University of Pretoria, discovered the beetle in the Pietermaritzburg Botanical Gardens last year. She published her discovery in the journal Australasian Plant Pathology, calling it part of "the surge in the global spread of invasive forest pests" because of globalization. The beetle has since moved to Johannesburg, 320 kilometers (198 miles) away, and spread across its urban forest, which according to the Massachusetts Institute of Technology initiative Treepedia has the world's sixth-largest green canopy cover. "This beetle doesn't actually eat the trees," Paap said. Instead it carries a fungus that blocks the vessels that transport water and nutrients, "which ultimately leads to die-back and death of the tree." Though scientists don't know just how many trees have died from the beetles' invasion, the outlook for Johannesburg is grim: "The city is going to lose a lot of trees." It is the older, more established trees that are at risk, said arborist Neil Hill. "So that's going to leave a gap in the landscape. And if we don't start to plant straight way with new trees that gap is going to become more and more of a concern as far as urban blight, pollution, aesthetic beauty." Hill has been experimenting with organic and chemical fungicides and pesticides and will continue in the spring when the trees are no longer in their dormant winter phase. Many city residents have expressed concern including Markus Scheuermaier, chair of the Johannesburg Urban Forest Alliance. "It's a real crisis for the city because the trees do provide shade, do provide pollution control, do provide all sorts of services that will disappear if the shot hole borer starts spreading across all the trees in Johannesburg," he said. Johannesburg City Parks' arboriculturist Adelaide Chokoe acknowledges it's a big problem with multiple hurdles in dealing with it effectively. How will residents from poorer suburbs view the city spending its limited resources on saving trees in the wealthy predominantly white northern suburbs? And how can the beetles be stopped? "So far there is no remedy that has proven to control this pest," Chokoe said.